The Ridesharing industry has changed the way we travel so much, that cities are restructuring their parking solutions. This booming sector of the economy is nurturing entrepreneurship, safe rides, and traveler confidence. And, as this adolescent industry reaches adulthood, both drivers and riders are discovering that there are opportunities to improve the experience. One area that rideshare drivers may have experienced is what Lyft calls “Lyft jacking”. It’s when someone other than the intended passenger snags the wrong ride. Perhaps the passenger is simply confused and just wants to get in a car and go. Maybe it’s when the bars let out, or at an airport, or after a big event, and finding the right ride can be a bit of a challenge. Uber and Lyft (the two biggest rideshare companies) have been trying to help with this situation with their drivers. 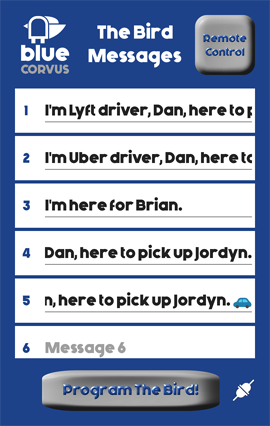 Lyft has a “Picking up the Wrong Passenger” article on their website with suggestions on ways to deal with the situation. Both apps give the passenger and driver a few details about each other like: car color and tag, name, and contact information. In reality, though, many cars look alike, especially at night. There are suggestions for riders to check the license plate and the driver should ask the rider their name. Nevertheless, confusion can still make its way into the experience. 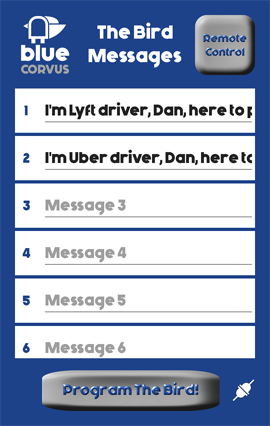 Lyft addressed this issue with their Amp. It changes color to match the color on the rider’s app, but the driver has no control over the glowing mustache. Uber relies on the info exchanged in their app and the driver’s ability to confirm his or her passenger before pickup. 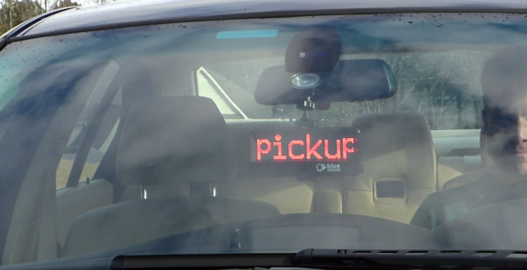 Both of these solutions help, but drivers may still find the pickup process to be flawed. Time to meet “The Bird” from Blue Corvus. Let that confusion fly away! With The Bird, it doesn’t matter what company you are driving for; you can easily be spotted and be on your way. The Bird’s scrolling message is visible from up to 90 feet away, even in bright sunlight. This will make your rider feel more comfortable and at ease finding you in a crowd. Finding you faster and with no confusion will likely translate into a better riding experience for them and a better driver score for you! There are countless “Rideshare Starter Kits” out there with comforts for your passenger once they have been picked up, but The Bird is the best product to make that pickup seamless.